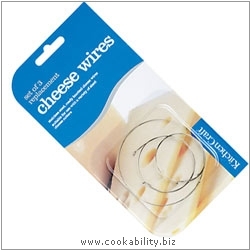 A set of three replacement 25cm cheese wires. Each cheese wire is 25cm ready knotted to fit the Kitchen Craft adjustable cheese planer or can be cut and knotted to suit other sized cheese cutters. Each wire is made from stainless steel and is therefore suitable for use with cheese cutters that are dishwasher safe.